Do we really need an excuse to party? The other day, I got an “invitation” in the mail. Party? Fete? Soiree? Gala? Nah, it was an invitation to a direct-selling party. You know: Avon, Tupperware, Silpada, Pampered Chef, Tastefully Simple… There are dozens of versions. 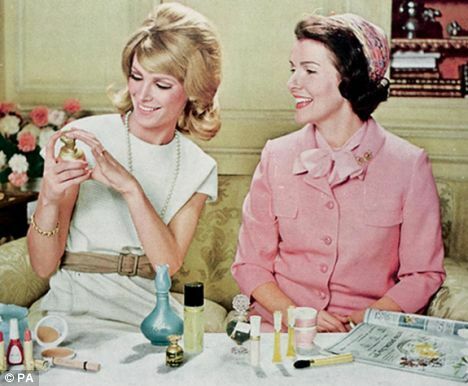 Now back in the 50s and 60s, direct-selling parties had a practical purpose. When my mother was a young wife, there weren’t nearly as many retail options and many households had only one car. 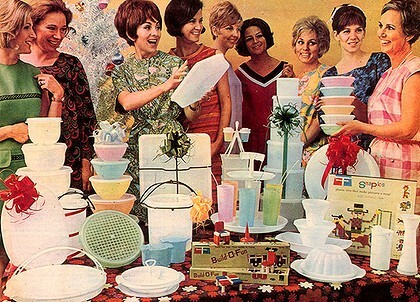 For a young mother, stuck at home with small children, an invitation to a Tupperware party was a welcome opportunity to socialize with “the neighbor ladies” while seeing some innovative new merchandise. Add in some fondue or that nifty lime Jell-o with the shredded carrots and cottage cheese and you’ve got yourself a PAR-TAY! Fast forward to today: I live in a major metropolitan area a mere four miles from the infamous Mall of America, one of the largest malls in the country. Moreover, I have high-speed Internet—which literally brings a world of merchandise directly to my front door. Access to retail is not a problem for me. Do I enjoy an evening or afternoon of socializing with other women? Generally, speaking: Yes. So long as they aren’t trying to sell me something. Although I have a pretty demanding full-time job, I understand the appeal of being an “independent representative” for a direct-selling company–either because your primary job is raising your children, or you just want to make a little extra money on the side. That’s all good. But I don’t understand the party-throwing aspect or the weird sense of obligation women feel to support each other in these efforts. I mean, I work for a company that pays me a bonus based on our revenue numbers, but that doesn’t mean I expect my friends to help me earn my bonus. I know a lot of women will disagree with me and sincerely welcome the opportunity to attend these parties. But I think the draw for a lot of women is they sincerely enjoy social time with their women friends, but feel guilty about getting together with them. Getting together under the guise of a direct-selling party alleviates the guilt of ditching dad with the kids for an evening, because you’re “supporting a friend’s business venture.” So the subject of this particular rant, er, post is: Why? Why can’t women just get together to socialize without it being related to one of them trying to sell something to the others? Thankfully, technology has made direct-selling without pressure an easier thing to achieve. These days, items can be sold via catalog parties, online or at an open house where the guests/customers can browse at leisure rather than sitting through a 30-minute pitch and waiting awkwardly for the order form to be passed along. Again, I’m not bashing the ambition of sisters looking to make an extra buck. Not. At. All. But let’s treat it like a business, not a social event. If you want to get together with your girlfriends—do that. But do it because you work hard (whether in the home or outside of it) and deserve a night of fun–not because you’re one party away from earning the hostess gift.